While it’s handy for us humans (and all of the other life on our planet for that matter), the atmosphere is almost universally cursed among astronomers. It’s great for breathing, but when it comes to astronomical observations of faint objects, all the atmosphere tends to do is muck up the view. In the past 20 years, development of adaptive optics – essentially telescopes that change the shape of their mirrors to improve their imaging capability – has dramatically improved what we can see in space from the Earth. With a new technique involving lasers (Yes! Lasers! ), the images capable with an adaptive optics telescope could be nearly as crisp as those from the Hubble Space Telescope over a wide field of view. A team of University of Arizona astronomers led by Michael Hart has developed a technique that helps calibrate the surface of the telescope very precisely, which leads to very, very clear images of objects that would normally be very blurry. 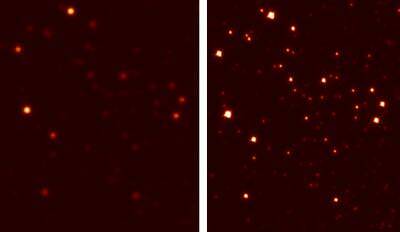 Laser adaptive optics in telescopes are a relatively new development in getting better image quality out of ground-based telescopes. While it’s nice to be able to use space-based telescopes like the Hubble and the forthcoming James Webb Space Telescope, they are certainly expensive to launch and maintain. On top of that, there are a lot of astronomers competing for very little time on these telescopes. Telescopes like the Very Large Telescope in Chile, and the Keck Telescope in Hawaii both already use laser adaptive optics to improve imaging. Initially, adaptive optics focused in on a brighter star near the area of the sky that the telescope was observing, and actuators in the back of the mirror were moved very rapidly by a computer to cancel out atmospheric distortions. This system is limited, however, to areas of the sky that contain such an object. Laser adaptive optics are more flexible in their usability – the technique involves using a single laser to excite molecules in the atmosphere to glow, and then using this as a “guide star” to calibrate the mirror to correct for distortions caused by turbulence in the atmosphere. A computer analyzes the incoming light from the artificial guide star, and can determine just how the atmosphere is behaving, changing the surface of the mirror to compensate. In using a single laser, the adaptive optics can only compensate for turbulence in a very limited field of view. The new technique, pioneered at the 6.5-m MMT telescope in Arizona, uses not just one laser but five green lasers to produce five separate guide stars over a wider field of view, 2 arc minutes. The angular resolution is less than that of the single laser variety – for comparison, the Keck or VLT can produce images with a 30-60 milli-arcsecond resolution, but being able to see better over a wider field of view has many advantages. The ability to take the spectra of older galaxies, which are very faint, is possible using this technique. By taking their spectra, scientists are better able to understand the composition and structure of objects in space. Using the new technique, taking the spectra of galaxies that are 10 billion years old – and thus have a very high red shift – should be possible from the ground. Supermassive clusters of stars would also be more easily scrutinized using the technique, as images taken in a single pointing of the telescope on different nights would allow astronomers to understand just which stars are part of the cluster and which are not gravitationally bound. The results of the team’s efforts was published in the Astrophysical Journal in 2009, and the original paper is available here on Arxiv. Isn’t this the observatory that is supposed to be looking at time sensitive targets like super novae, but they must wait through a long approval process every time they want to use it that makes it pretty much worthless? Apparently the gov needs to be sure no military planes will be flying in the area but of course will give no schedule of their flights to the observatory for them to plan around. … Or is that some other US observatory with brand new laser adaptive optics technology? The limitations affect all observatories in the United States. Space Command is worried lasers will cause problems with the optics of their satellites used to view Earth. So whenever a satellite flies over an area the laser must be turned off for a few minutes to allow the satellite to fly by. The problem with supernovae is nobody knows when an event will happen, and observatories must submit where (in the sky) and when they want to use their laser for adaptive optics no later than 3 days in advance. Space Command then approves/disapproves and also provides the times they must have the laser off. Actual risk to satellite optics isn’t known for sure. However, the lasers used are powerful. They are used to excite sodium atoms at an approximate altitude of 50 miles; obviously the light is going to travel far beyond this point, and many Earth facing military satellites fly very low in orbit to for better quality results. This isn’t a closed item. There are alternatives being worked and attempts to figure out what if any damage may occur. Unfortunately during a time of war, it isn’t a huge priority and may take a while to resolve. So a commercial/amateur A/O version is pretty much ruled out? God i can’t wait to see the JWST out in space !!! I have some visualising problems with quotes. i see the “quote” window allways of the same size(little) and the writing is out of the window. I think it’s because i’m using Opera 10.60 as a browser. haha come on now … in a time of war? As if there’d be any difference otherwise. You would have instead said, in this time of vigilance. But at least the war is finally focused on the right country, even if all it’s doing is keeping Karzai’s corruption scheme going, but really what do you expect from a typical US installed puppet leader? So whenever a satellite flies over an area the laser must be turned off for a few minutes to allow the satellite to fly by. So you basically say that all you have to do to point a laser to the satellite and it is blind? I hope Iran and North Korea does not know how to build lasers. From guide star to guide star cluster, eh? It’s really a low intensive war in Afghanistan (barely qualifies as one, by the sociological definition of > 1000 deaths/y), and doesn’t seem to be a reasonable excuse for US planning. tests by the US have employed lasers outputting 30 watts. Those can be found rather cheaply. our atmosphere is turbulent blurring images requiring a time exposure to gather enough still light. Good seeing nights occur when the starlight is steady unflickering and a calm clear night is often cooler temp for less atmospheric disturbances mostly in lower atmospheric levels, and why mountains help the seeing above most city smog. In the milky way galaxy especially in the southern hemisphere towards the central core, vast dust and gas is forming stars rotating in the flat spiral galactic plane, and these optical effects reappear in our solar system and galaxy which they see thru with radio telescopes. We need a way to cancel distortions from the solar system, and milky way, and produce clearer photos of distant objects as would be seen naturally in the intergalactic medium that is between galaxies where a single photon captured may show far more detail information having traveled a straight path to the detector. Next PostNext Observing Spotlight – Whatever Happened to M71?